Just a few years ago, when kids began having their own phones in large numbers, schools freaked out. At my daughter’s junior high, phones had to be hidden away in backpacks or lockers. Any teacher who observed a student with a phone was required to seize it. The phone was then taken to the office, and there was a $15 fine to get it out of hock. Of course, it isn’t just the fact that teachers and administrators are tired of fighting the ubiquitous phones and their larger cousins. Slowly, educators are realizing the benefits of social media. And, as those in charge learn more about the remarkable versatility of the internet, the applications are becoming an integral part of the students’ learning experience, arguably making them more engaged and interactive than ever before. Sites like Facebook, Twitter, Tumblr, and even one of the relatively new social media sites, Pinterest, are giving education a much-needed boost. Twitter: “Teachers have been setting up subject or class Twitter accounts that students can follow. The teacher then tweets information related to their class. Some even set homework via Twitter,” reports The Guardian, in their article “Social media for schools: A guide to Twitter, Facebook, and Pinterest.” Twitter, as many have discovered, is also often the fastest way to find out about breaking news. Facebook: I have often asked my own students to post a specific status and have their friends respond. Then, the following class period, we discuss those responses. For example, I recently had them read Hal Niedzviecki’s New York Times article, “Facebook in a Crowd.” Niedzviecki wonders what would happen if he invited many of his “virtual” friends to a real life cocktail party. Of the several hundred invitations, twenty people accepted; one actually showed up. I asked my students to post as their status, “Is a virtual friend a “real” friend?” We had a lively discussion that could not have happened otherwise. Pinterest: Not just a place to “pin” your favorite recipes or cute cat photos. Many teachers have found great success, especially for their highly visual learners, using Pinterest’s “Tutorials.” Here, among other things, you can learn, step-by-step, how to create QR codes, or become more proficient in Photoshop, or learn how a touchscreen works. Tumblr: Again, a great site for students and educators. More and more companies have begun to “tumbl,” as it is a great way to find archival materials as well as current news and discussions. Some of my favorites, which I often use to prepare lectures, are the tumblrs of “The Paris Review,” Life Magazine, the New York Public Library, NPR’s Fresh Air, and, of course, eNotes. 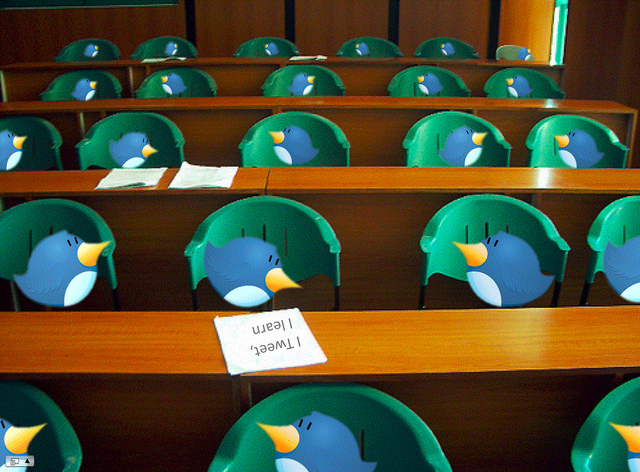 How do YOU use social media in the classroom? Whether you are a teacher or a student, we’d love to know.